The ProForm SMART Endurance 920 E Elliptical Trainer Is ON SALE! A Great Cross Training Option for Only $1099! 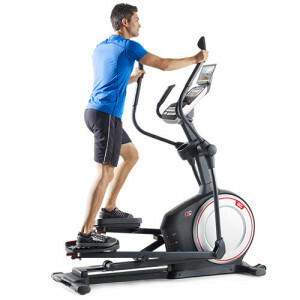 The ProForm SMART Endurance 920 E elliptical trainer is a great cross-training option in the $1099 price range. It has several features that elevate it above the ProForm Endurance 720 E model. ProForm is part of Icon Fitness, who happens to be the largest manufacturer of fitness equipment in the world. This is the same parent company that makes NordicTrack. For this reason, ProForm can often offer more specs for the price. We especially like that this machine has iFit technology, a 7″ Smart HD color touchscreen, and a heavy 25 lb flywheel allowing for smooth and balanced motion. MID-WEEK SALE ENDS THURSDAY: The ProForm SMART Endurance 920E is priced at $1099. No interest financing available, free shipping . iFit Live on the ProForm Endurance 920 E Console. 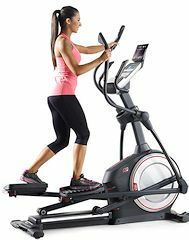 7″ Smart HD Touchscreen – This newest model SMART Series elliptical has an upgrade console that is optimized for iFit Coach Live workouts. The touchscreen is faster and more responsive. 25 Lbs. Flywheel —A heavy flywheel contributes to a smooth and natural elliptical motion. This is one of the heaviest wheels you will find on a budget treadmill. 19” Power Adjustable Stride — This length of stride works well for most people. It provides a better elongated motion rather than a short and choppy motion. Oversized, Adjustable Foot Pedals — This feature helps you adjust the angle of the foot pedal for comfort and to avoid toe numbness. Custom workouts can be created based on your personal goals. The workouts progressively get harder over a period of several weeks and even provide audio coaching. Your stats will automatically be uploaded to your online profile so you can track your progress. Tracking progress is a proven way to help people actually achieve their goals. iFit allows you to simulate outdoor exercise with Google Maps. You can track your route and the incline will adjust to match the actual terrain. Interactive videos from the iFit library will allow you to workout on famous landscapes around the world. The ProForm Endurance 920 E will sync with your speed and incline. iFit “Coach Ready” means that this machine is ready to connect to your online account with only a wireless Internet account. NOTE: This SMART Series model comes with a FREE 1-year of iFit Coach membership included in the cost. Heavy Weight — This is a heavy machine, which means it is also very stable. ProForm SMART Endurance 720 E – Read our full review here. Just like the 720 E model, the ProForm SMART Endurance 920 E offers great value for around $1099. The 325 lb user weight limit is a little excessive, so we would caution people over 300 lbs from purchasing this machine. That said, the 25 lb flywheel, adjustable foot pedals, iFit Live, and 7″ color touchscreen make this one of the best buys in the price range. 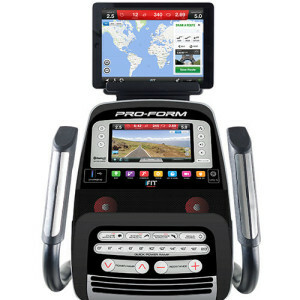 If you want to spend around $200 less, you can buy the ProForm Endurance 720 E. It lacks the Smart HD Touchscreen and has fewer programs and a lighter flywheel.